Kinston is a town in Coffee County, Alabama. At the 2010 census, the population was 540. Kinston is located in the southwest corner of Coffee county. According to the U. S. Census Bureau the town has a total area of 4.9 square miles and has an elevation of 269 feet. New Police chief sworn in. 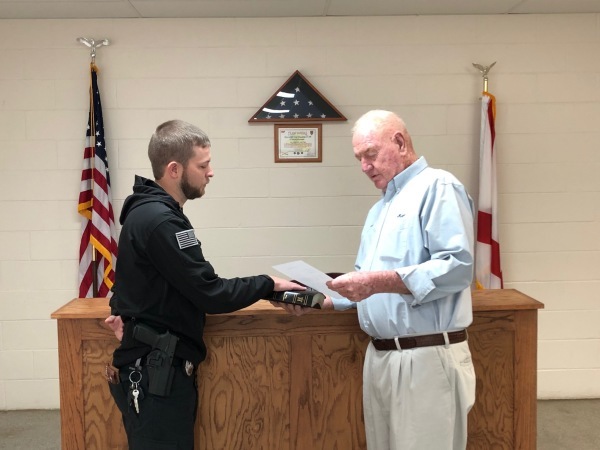 On February 15, 2019 Mayor Bill Mullins administered the oath of office to the new police chief. Effective April 1, 2019 Arrow Disposal Service will provide solid waste collection that was previously done by MDI. Customers will continue to use the existing trash containers. Arrow will put new decals with their name, customer service information and the day of collection on the containers. Please note the day of collection will change from Friday to Thursday and the first collection date will be APRIL 4, 2019. Kinston Town Hall is located at 856 Main Street. All town activities are handled from this location. The Mayor, police department, town clerk, water department and town meetings are all located here. Town meetings are held the first Thursday of each month. All citizens are urged to attend.